Doncaster Voices: What ‘spring clean’ does Doncaster area require? If you want to get involved in DFP weekly Voices forum, submit 150 words, name, title & photo to barbara.craythorn@jpress.co.uk and your views may appear next week when the timely subject, marking this month’s World Book Day is: How can we best raise Doncaster literacy? Over the last year or so the sowing of meadow flowers on Doncaster roundabouts and grass verges has been a wonderful idea. Long may those good ideas continue. So what about the plastic? Not just a Doncaster problem but the proliferation of litter these days is a sad reflection on our society and a disrespect for our environment. Worst of all are the plastic bottles and (unnecessary?) plastic packaging for just about every product imaginable. Maybe some clever person can think of a way of reducing the use of the stuff within our borough? Start by encouraging local shops and supermarkets to ditch the plastic and go back to paper & biodegradable? Maybe charge them a plastic bag levy like they do us? Don’t know about you but the price of a plastic bag in the local shop is no deterent to yet another bag purchase. In my case the problem’s not parsimony but alzheimers. Chez Willis has 4235 plastic bags stuffed under the sink! Want one? 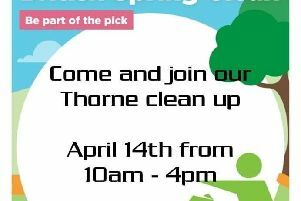 Seriously though: a regular campaign of litter picking with everyone involved could transform the cleanliness of our town. With the help of the local media, council and posters in every window (paper ones) dropping litter could become as unacceptable as licking someone else’s lolly or breaking wind loudly in church. To engender some pride in and care for our town is the way forward. The hard bit will be spreading that message and getting everyone to buy into it. Let’s start small, by taking radical, imaginative action on disposable cups. They blow everywhere, are mostly not recyclable, decompose slowly and leach toxins into the environment. Modbury in Devon led the way for England in turning its back on single use plastic bags, and now we all try to make sure that we leave the house armed with our own bags. Can Doncaster take up the baton, and ban the use of disposable cups? For a modest deposit, say a pound, we could launch the Doncaster Cup which could be returned to any participating outlet, and swapped for a clean one, which could have up to hundreds of uses. The cup itself could be made using recycled materials and minimal ink, with a disposable lid. The outlets would need council support in collection and sterilisation, but there are huge gains to be had in terms of sustainability, reduced waste, and a cleaner environment. Sepulchre Gate by the Card Factory and along the whole of that area. I personally tripped outside Santander Bank. The worst area is Cleveland Street in front of the Urban Pub and the entrance to the Colonnades where the flags move as you walk on them, parts of Printing Office Street and Scott Lane in fact all the main shopping areas. Stiffer penalties are needed for people who just drop rubbish anywhere, that includes a lot of Mother’s who just allow children to drop litter and walk on. I realise that with all the Government cut backs to local authorities, the Council does have to prioritise but just wonder how many claims have been made by people having serious falls, thus raising insurance premiums. It’s such a shame that many areas of Doncaster’s natural beauty are tarnished with rubbish and litter. I live in Cusworth and the main concerns are the walking routes that surround Cusworth Hall, which is part of the Trans-Pennine Trail. The entire stretch is covered in litter and much of this is left by youths who frequent the area for leisure. Not only them, but dog walkers leave dog waste that is unsightly and hazardous. The waste bins around the hall are always full but this shouldn’t mean that people feel free to ruin what could be a pleasant walking route. It is also a site used for the tipping of furniture and waste. If the area was cleared up, I’m sure many people would feel much safer using the path. As it is now, I would not feel comfortable walking there alone, which is a view shared by many. * If you want to get involved in DFP weekly Voices forum, submit 150 words, name, title & photo to barbara.craythorn@jpress.co.uk and your views may appear next week when the timely subject, marking this month’s World Book Day is: How can we best raise Doncaster literacy? 5 What’s the most foolish thing Doncaster has ever done? 12 Is Doncaster ​eco-​green enough? 19 Are we too patriotic or not patriotic enough?